The work of Julien Airault is part of the movement of lyrical abstraction, carried mainly by the Chinese art scene of the second half of the 20th century. His artistic influences include Zao Wou-ki and Chu Teh Chun. Julien Airault has been interested in art for more than 10 years and he begins, initially, the practice of watercolor. As a result of an upheaval in his personal life, he decided to paint his first abstract paintings. However, being self-taught, he has to prove himself in the very demanding world of art and begins to exhibit in gallery with portraits in an expressionist style with which he will be very successful. It is a precocious and deserved consecration for Julien Airault. The canvases are an invitation to travel in time and space. At first glance, we perceive the virtuosity of the traditional art of the brush as it was practiced in China with the wash on silk. The artist draws our attention not only on the lines, the material, the colors and the transparency but also on the canvas that the painting transforms. Transparencies and materials are born under the multiple caresses of the brush and transport us into the magic of lyrical abstraction. 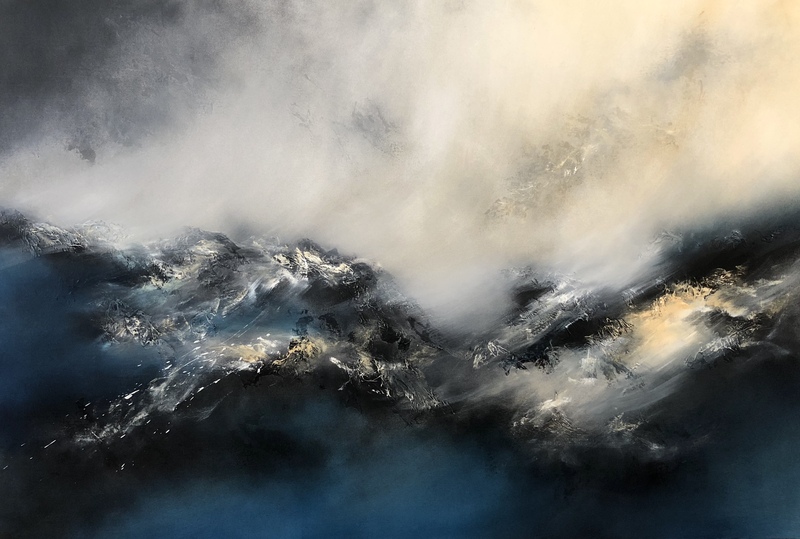 Even when he reduces his canvas to the simplest touch of white on which he projects pigments and sometimes marble powder, it creates a space like a real abstract landscape. The emotions felt in contact with his works make it possible to capture his first artistic intention and to understand the universe he invites us to share.